But I love Janel for more than her unique accent. I love her for her heart, for her friendship, and for the fact that she has persevered through some incredibly difficult relational wounds. Art has and continues to be an outlet for her. Maybe you have seen some of her “work” work. If you’ve ever bought one of those pretty packages at the post office that make the simple manila envelopes weep, there’s a chance Janel designed them. She also designs wrapping paper, including a unicorn-with-a-party-hat themed paper which I like to believe was inspired by…ME. And if you’ve ever received a postcard from me that has a little baby unicorn on it, you can thank Janel. 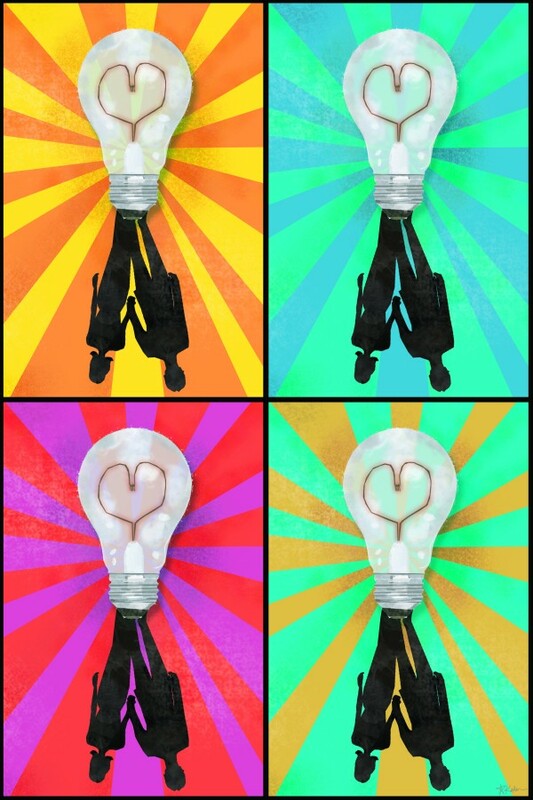 Here is a pop-art piece she contributed for The Illumination Series. Despite all things, past and present, true or false, clear or misunderstood, there is pure, bright light shining continuous, possibly forever throughout time, when a deep communion exists between two people. God’s enduring love is reflected in this union. The male and female come together to ignite one brighter light. Through this lamp, their community is influenced with the transcending light exposure. Do you have a loved one that reflects God’s enduring love in your life? How can you be an illuminating light to others? Check out Janel’s most recent painting she submitted to the LRN Gallery HERE. We would love to see your work as well! Janel Kaden is the current director of an extensive art department leading the gift and paper industry. She is also the Creative Director of The Give N Go Project, (www.thegivengoproject.org) bringing the gift of soccer to children living in and experiencing devastating situations. Her work is represented by Jillson & Roberts, and can be purchased all over the world. Check out The Give N Go Project HERE. Check out Janel’s website HERE.